Are Super Funds going to flood our property markets? In a recent blog author of Get a Financial Grip Pete Wargent argues that a flood of Self Managed Super Fund capital is likely to wash into our property markets over the next few years. Pete suggests that with investment results from capital growth in equities so poor (i.e. non-existent) over the past seven years, more Australians than ever are turning to self-managing their superannuation funds in a bid to improve their floundering returns. He says that most individual investors in equities become transfixed with immediate capital growth returns from shareholdings, rather than what we should be focussing on, which is the growing income or dividend streams over time. Although intellectually most of us probably know that stockpiling equities while they are cheap will be a fabulous long-term investment, emotionally most of us want to see fast returns forthcoming over the next few years. At present, the stock market doesn’t seem to be promising that, but with property mortgage rates now so low, the property markets are seemingly offering some mouthwatering opportunities for counter-cyclical investors. Wargent argues that using the banks’ cheap CAPITAL is currently looking more attractive than buying SHARES in the banks. Why will SMSF’s dive into real estate? There are a whole host of reasons why this will happen: the ability of SMSF’s to use leverage, the Australian love of bricks and mortar, excessive superannuation fund management fees, painfully low returns from some super funds over half a decade, a desire to take control…to name but a few. Wargent offers three quick pointers and screen-grabs which explain exactly why the property markets will be flooded with investment capital from SMSF’s in the next few years. Firstly, the actual dollars under self-management are spiralling. This is both effect (and in some small part, cause) of the poor returns from equities and thus managed super funds with are heavily exposed thereto. Suffice to say that funds under self-management are now significantly higher than they have ever been before. According to BMG Partners, the figure now exceeds $1 trillion. Secondly, every time the strong dollar looks as though it may be weakening, a bout of investment in Australian dollar denominated assets and/or speculation sees it firing upwards again (to more than 105 US cents again today). 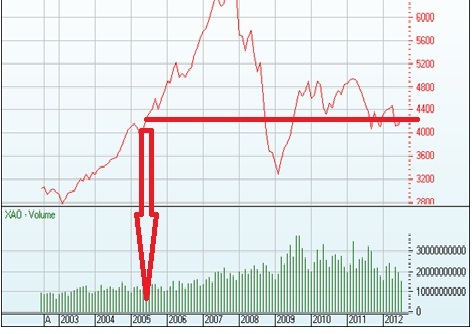 This hampers investment in equities from overseas and in turn kills the Australian stock market’s momentum. Although measurement thereof is nigh-on impossible, probably somewhere between one quarter and one third of Australian shares are owned by investors from overseas, with much of that cash coming from Asia. Thirdly, the Aussie stock market – the market which most of us focus on rather than venturing elsewhere – is failing to inspire any confidence from investors at all. 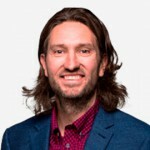 At the time of writing his blog the XAO (All Ordinaries) closed at 4,266 – a number which may look uncannily familiar to investors who started out in their investing quest in mid-2005. While Pete has presented three graphs in a linear fashion, it should be fairly obvious that the three trends are inextricably linked! I try to mix it up a bit, but do I think the super/property story (for better or worse) could be a significant one over coming years. This isn’t advice as such, but if a super fund is under self-management it can be used to buy investment property or other investments. There are a whole host of restrictions (you can’t use a super fund to buy a residence in which to live while the property is in the fund, for example) so it’s not a course of action to be taken lightly by any means. Financial planners can help if you aren’t sure about the rules. Employees of the commonwealth cannot touch their super no matter how much it accumulates. Do you have an advice on this? 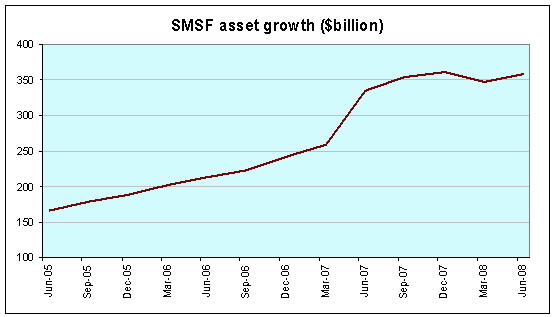 You are right that government employees must stay with their “industry” super funds and cannot set up their own SMSF. That is an issue as the industry funds have not been performing well over the last few years.